Kyle Shewfelt Gymnastics strives to make your experience with us friendly, honest and hassle-free. Kyle Shewfelt Gymnastics reserves the right to cancel any programs with insufficient registration one week prior to program start date. If KSG cancels your class due to enrollment or scheduling issues, we will transfer you to the next available class of your choice. If we can not find a comparable and convenient alternative option, you will receive a full refund with no additional administrative fees. Please note that Gold Medal Memberships are only refundable in this circumstance. Cancellation of a registration prior to classes commencing will receive a full refund (less a $30 administration fee per cancellation) or a full credit can be applied to your account for future use (with no additional administrative fees). Please note that Gold Medal Memberships are non-refundable. If you/your child are not completely satisfied after your first class of the session, KSG will refund your full session tuition. We strive to create an exceptional experience and we hope that we can exceed your expectations. Please note that Gold Medal Memberships are non-refundable. After your first class, Kyle Shewfelt Gymnastics maintains a NO REFUND policy on all of our fees in order to ensure proper safety and staffing for our classes and events. After the first class of the session, refunds are issued for medical reasons only and a medical certificate or doctor’s note must be provided. Medical cancellations will receive a pro-rated refund (less a $30 administration fee per cancelation) or a pro-rated credit can be applied to your account for future use (with no additional administrative fees). Please note that Gold Medal Memberships are non-refundable. Class change/transfers are based on availability and must be approved by KSG Management. Please contact us for more information. Please also see the Class Change/Transfers section below. Please note that during our Fall, Winter and Spring Sessions, unfortunately, participants are turned away from our programs due to lack of available room. The more notice we have of cancellation, the better our ability to fill that space with another interested participant. Kyle Shewfelt Gymnastics reserves the right to cancel any programs with insufficient registration one week prior to program start date. If KSG cancels your class due to enrollment or scheduling issues, you will receive a full refund with no additional administrative fees. Cancellation of a registration prior to classes commencing will receive a full refund (less a $30 administration fee) or a full credit can be applied to your account for future use (with no additional administrative fee). If you/your child are not completely satisfied after your first class, KSG will refund your full session tuition. We strive to create an exceptional experience and we hope we can exceed your expectations. After the first class of the session, refunds are issued for medical reasons only and a medical certificate or doctor’s note must be provided. Medical cancellations will receive a pro-rated refund (less a $30 administration fee per cancelation) or a pro-rated credit can be applied to your account for future use (with no additional administrative fees). Class transfers are based on availability and must be approved by KSG Management. Please contact us for more information. Please also see the Class Change/Transfers section below. Please note that during our Evening Mini Sessions, unfortunately, participants are turned away from our programs due to lack of available room. The more notice we have of cancellation, the better our ability to fill that space with another interested participant. If a refund is requested at least one month before the first day of camp, you will receive a full refund (less a $30 administration fee) or a full credit can be applied to your account for future use (with no additional administrative fee). If a refund is requested between one month and one week before the first day of camp, you will receive a 50% refund (less a $30 administration fee) or a 50% credit can be applied to your account for future use (with no additional administrative fee). If requested less than one week before the first day of camp, no refund or credit will be issued. All transfers are subject to availability and must be requested more than one week before the initial camp start date. One transfer per registration is permitted. Once a transfer has been applied to a registration, no future refunds or credits will be issued. If your child is ill or, for any reason, misses one or more days of camp, we will not be able to provide a partial refund. After the first day of camp, refunds are issued for medical reasons only and a medical certificate or doctor’s note must be provided. Medical cancellations will receive a pro-rated refund (less a $30 administration fee per cancelation) or a pro-rated credit can be applied to your account for future use (with no additional administrative fees). Every year, unfortunately, children are turned away from our camps due to lack of available room. The more notice we have of cancellation, the better our ability to fill that space with another interested participant. In order to provide a high quality experience and to ensure proper staffing of this day camp, we have a no refund policy on our Drop and Shop Camp one week prior to the camp start date. If a request for cancellation is received in writing with a minimum of one week before the camp date, we will provide a refund minus a $30 admin fee or we can provide a full credit to your account to be used at a later date with no admin fee. If your child is ill or, for any reason, misses the camp, we will not be able to provide a partial refund. GOLD MEDAL Memberships are non-refundable. Becoming a GOLD MEDAL Member is required for all registered sessions including our Fall, Winter and Spring sessions as it includes mandatory and important insurance. GOLD MEDAL Memberships are valid for one (1) year and encompass one Fall, Winter and Spring session during the annual term. Example – if you purchase a Spring 2019 Membership, it will be valid for the Spring 2019, Fall 2019 and Winter 2020 sessions. A new Membership will be required for the Spring 2020 session. As a GOLD MEDAL Member, each session registration is based on availability and will be issued on a first come first serve basis. Due to coach/athlete ratios and classes subject to filling quickly, using your priority registration privileges does not necessarily guarantee you a spot in your desired class. If your desired class is full, please add yourself to the waitlist. If an open spot becomes available, we will contact those on the waitlist in priority order based on the day and time they were added. If an open spot becomes available, individuals will be contacted by phone and email and given 24 hours to accept the open spot before we move to the next participant on the list. Due to program demand and high waitlist volumes, once a waitlisted participant has been offered an open spot in one of our programs, they will be removed from all other waitlists. We do this in order to move through waitlists at a reasonable pace and successfully fill our classes. Please only waitlist for programs that you highly desire and that will fit your schedule. All fees are due at the time of booking. Please ensure you are confident with your party date and time before proceeding with your booking. If cancellation is received from the time of booking and 4 weeks prior to the party, KSG will refund the full amount of the party fee minus a $30 administration fee or apply an account credit for the full amount with no admin fee. If the cancellation is received between 4 and 2 weeks prior to the party, KSG will refund 50% of the party fee minus a $30 administration fee or apply an account credit for 50% of the party fee with no admin fee. If the cancellation is received less than 2 weeks prior to the party, no refund or credit will be issued. A minimum of 4 weeks notice must be given to switch the date/time of your party. Switching the date/time of your party will result in a $30 administration fee. There is a limit of one date/time change per booking. In order to keep the party safe and fun, we require you to keep the guest list to a maximum of 16 participants. Please remember to include the Birthday child and all participating siblings in this count. Participants 4 years old and under require a caregiver to accompany them in the gym for the duration of the party. We understand that it is hard to keep guest lists from growing, but please be respectful of this policy so we can work together to make this the best party for your child! Any additional children above 16 guests will be charged $25+GST up to a strict maximum of 20. All party attendees must have a signed waiver in order to be permitted entrance into the gym. Download Waiver. To avoid disappointment, we highly recommend you book early. Our parties book up 2-3 months in advance. *Please note that account credits can not be applied when you select the Installment Payment option. If you have a credit on your account that you would like to use, please call us after making the first installment payment and we can manually apply the credit to your second installment. Please note that the installment payment option is only available until one week prior to the second installment payment due date. After this date has passed, installment payments are no longer available for the upcoming session. The first installment payment of 50% of the purchase total plus the full cost of the Gold Medal Membership is due at the time of registration. This will secure your spot in the class. The final 50% balance is due +/- 2 weeks before classes commence (may vary depending on Session dates. We will send an email reminder to those with outstanding balances prior to processing any payment). We will automatically run the final balance through on the same credit card or E-check account used for the initial installment payment. Any final balances that do not process due to insufficient funds or a change in account information will be subject to a $30 Administration Fee. We will then contact you for an alternate payment method. All balances not collected 7 days before the session start date (eg – The Fall 2018 Session starts on September 10th so all balances are due by September 3rd) will result in the immediate withdrawal from the program and your spot will become available to those on the waitlist. In this circumstance, the initial payment will be refunded minus an additional $30 Administrative Fee. Please note that multi-person and multi-class discounts are only applied to our Fall, Winter and Spring Sessions. We offer a 5% discount for the second participant from the same family in the same session and a 10% discount for any additional participants from the same family in the same session. We also offer a 10% discount on multiple classes by the same participant in the same session. These discounts are applied to class of lesser value. If you are registering multiple children from the same family or for multiple classes within the same session, you must add all of your classes to your cart before checking out or the discounts will not be applied. If you do not register all family members and/or for all classes on the same transaction, the system will not automatically apply the multi-class and multi-family member discounts on later transactions. If this occurs, please call us at the gym and we will apply a refund for the discounts. 587-349-2004. Please check individual program information for any special promotions and discounts (eg – $20 Birthday Discount for Members, $30 off second child for Kids Night Out Camps, etc). The recommended registration method is online with a Credit Card or E-Check. We can also process registrations at our facility for those who wish to make their purchase using cash or interact debit. Due to a high volume of calls on registration day, we are not able to process registrations over the phone on registration days. GST (5%) is NOT included in pricing unless otherwise stated. NSF payments will be subject to a $30 administration fee. Failure to make payment prior to your child’s program start date will result in a cancellation of your child’s registration. Due to child/class/coach ratios and the structure of our programs, make up classes are NOT offered. Class changes/transfers are subject to availability and will only be permitted once per session. A difference in class price may occur and the balance owing must be paid at the time of the transfer. Any additional transfers are subject to availability and are subject to a $30 administrative fee. We follow the Calgary Public Schools’ holiday and weather schedule. A list of gym closures due to Statutory Holidays or events will be posted on the KSG website and social media and class schedules. If you are unsure, please call the gym or email us. ShewBucks Referral Rewards are applied as a credit to your account prior to the next registration period. These credits can be used to offset fees for future programs available for online registration only. For each reference, we will apply one $10 credit per account. If multiple children from one family register and one person is mentioned as the referrer for all, only one $10 Shewbucks Credit will be applied to this individuals account. The referrers FIRST and LAST name must be present on the referral form. Only first-time customers with new accounts are eligible to designate a referrer to receive Shewbucks. A child may be expelled without refund if his/her behaviour is abusive to classmates or staff. A child may be expelled for destruction of equipment or the property of others. It’s important to pick up and drop off your child on time. We have a flexible 5-minute window to pick up your child. Any pick-ups after this time will be charged $5 per 5 minutes and this balance will be applied to your account. If you have an emergency, please call the gym and we will do our best to accommodate. Parent supervision is required in the viewing lounge prior to class start time. No early unsupervised drop off is permitted. Kyle Shewfelt Gymnastics is NOT responsible for lost or stolen property in or around our premises, including the gym floor, the observation area, or your vehicle. Please do not leave purses or other valuable in plain sight in your vehicle as we have experienced targeting from thieves in the past. We accept no responsibility for articles left behind. Kyle Shewfelt Gymnastics personnel are not permitted to accept responsibility for personal articles. Please lock all valuables in a locker which can be found in the gym. All water bottles left will be thrown away and all lost and found items will be donated after the last day of the session. Please wear shorts and a tshirt or a body suit. Barefeet is best. We sell KSG grippy socks in our proshop for those who would like to wear socks in the gym. Please no jewelry, earings, belts, jeans or loose fitting clothing. Long hair must be tied back. We have a water fountain in the gym and a Kinetico filtered water station to fill up water bottles in our viewing lounge. We pride ourselves on creating an inclusive environment and we do our best to accommodate most situations. To ensure a safe and high quality experience for all participants and staff, those with a special need that require one on one attention will need to have an aid accompany them in the gym. Please keep in mind that our staff are trained gymnastics coaches, but do not always have the necessary certification or knowledge to accommodate those with special needs. Please indicate any special circumstances under the medical notes in your online profile so our staff can be aware prior to commencement of classes. Each situation will be handled on a case by case basis, keeping safety and a quality experience for all in mind. KSG reserves the right to request a participant have a one on one aid for their class if our staff determine this will create the most positive experience for all. All additional costs associated with this request will be the responsibility of the participant’s caregivers. All participants must have a fully executed waiver signed by a parent/guardian in order to be permitted gym entrance. Waivers are required for each participant once per July 1 – June 30 calendar year. All participants must have a fully executed trampoline specific waiver in order to be permitted gym entrance. Waivers are required for each participant once per July 1 – June 30 calendar year. Use of all trampolines is at your own risk. Payment is required for children 1 year or older and/or any infant not in a carrier or bucket seat while in the gym. Maximum of 3 participants per supervising adult. Parent or Guardian must be in the gym providing direct supervision at all times. All participants must have a fully executed waiver signed in order to be permitted gym entrance. Waivers are required for each participant once per July 1 – June 30 calendar year. 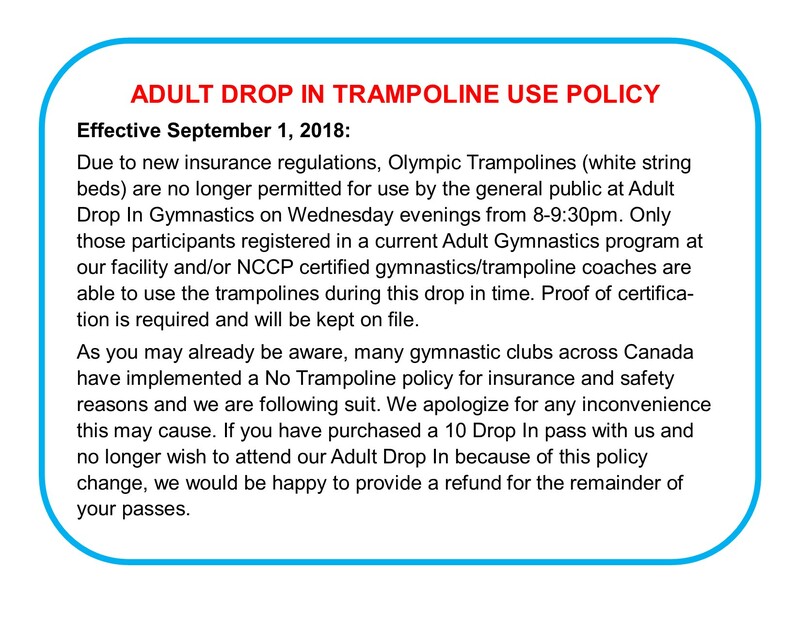 Use of Olympic trampolines is only permitted to those in our registered programs and NCCP certified gymnastics/trampoline coaches. Please see our our notice for more information on this policy. Anyone appearing to be under the influence of drugs or alcohol, including marijuana, will not be permitted entrance to the gym. Adult Drop In Rules can be found here. Trampoline Rules can be found here. Our Adult Drop In culture is one where participants respect themselves, our space and each other. Although unstructured, the energy and vibe of this evening is not a free for all. Our environment is open to mature and responsible adults who do not put themselves or others in danger. We have a zero-tolerance policy for taking unnecessary risk. Those “chucking” skills without demonstrating the proper basics will be asked to leave. Those not sharing equipment will be asked to leave. Those appearing to be under the influence of any prohibited substance will be asked to leave. Anyone who puts our supervisor on high alert will be asked to leave. These rules are strictly enforced and we ask that all participants play a role in helping to keep our space safe and welcoming. Making any kind of sexual advance, making a request for sexual favours, or engaging in other verbal, visual or physical conduct of a sexual nature is prohibited. Our organization has a zero-tolerance policy for non-related one-adult/one-child interaction including rides to/from practice, in the gym and on the facility premises. Another coach, student or adult must always be present. We adhere to the Canadian Coaching Association’s Rule of Two in all circumstances. Staff are forbidden to make personal calls or send texts/emails to minor students. All communication must be handled through the participants caregivers and our office. Staff are forbidden to entertain minor students in their homes, unless it’s a group function approved by management and another adult is present. If you suspect an incident of possible abuse, please immediately inform proper law enforcement agencies and our management team. In the event that a suspected incidence of abuse is reported, the staff member in question will be temporarily suspended from duties while an investigation takes place. In all circumstances, Kyle Shewfelt Gymnastics will inform the proper law enforcement agencies and entrust them to conduct a comprehensive investigation and supply us with the results. If the investigation reveals foul play, the staff member will no longer be permitted to work at our facility and they will be reported to all appropriate agencies included Alberta Gymnastics, Gymnastics Canada and SafeSport. If the investigation is inconclusive, Kyle Shewfelt Gymnastics has the legal obligation to reinstate said employee to their regular duties.